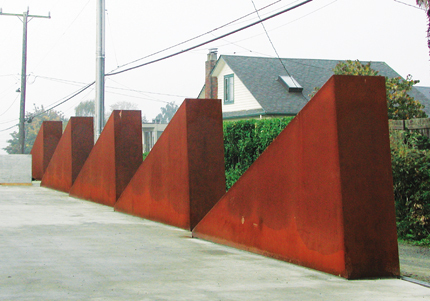 Once again, we’ve prodded West Coast architects to divulge their favorite sources for us, from contractors and consultants to suppliers and top fabrication shops. The results are illuminating and useful, revealing industry leaders as well as hidden gems. And in these tough times, no one can afford to waste time or money with anything but the best. So here it is: our second annual California Favorite Sources feature. All images courtesy cited firms, unless otherwise indicated. When banks in Iceland filed for bankruptcy in October and credit lines dried up, Iceland’s building industry went into a tailspin: Contractors halted construction, developers cancelled new projects, and thousands of foreign construction workers left the country almost immediately. Next to fall victim were architects. 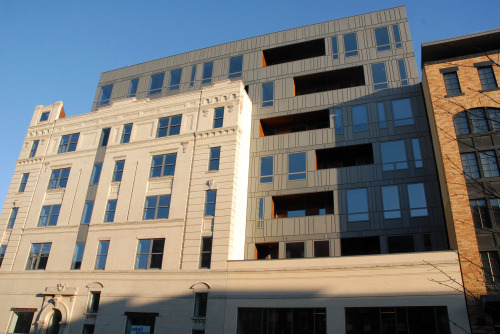 As construction ceased, architecture firms saw an almost complete drop-off in new projects. By the beginning of November, architecture firms across the country announced massive layoffs. As of February 1 of this year after a three-month grace period, an estimated 90 percent of Icelandic architects became unemployed. Now, as Icelanders sift through the fallout of a decade of frenzied real estate speculation, much of the detritus is new construction. Large swaths of suburbs surrounding the Reykjavik metropolitan area stand empty, many of the houses only partially built. In downtown Reykjavik, construction is halted on the 1.07-million-square-foot Icelandic National Concert & Conference Center, a 30 billion ISK (approximately $500 million) joint venture between Portus and the Reykjavik city government. The current state of the real estate sector stems from the fact that despite its old history, Iceland is essentially a young country—it declared independence from Denmark only 64 years ago—and lacks an established urban development practice. The Reykjavik city planning authorities were largely unequipped to oversee the sharp increase in construction, leading to embarrassing city planning missteps. 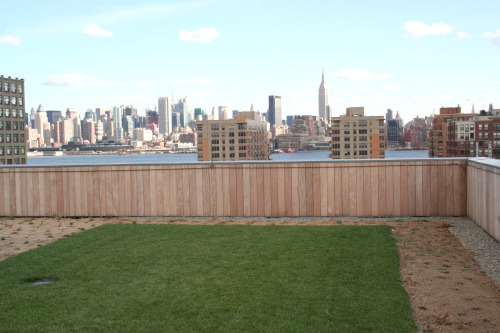 Olafur Mathiesen, an architect at the firm Glama/Kim who now finds himself unemployed after 12 years, explained that the lack of coordination between local communities and zoning and planning practices led to a form of ad-hoc urban development, resulting in a suburban sprawl of shoddily built multi-family housing, out-of-place highrise apartments, little green space, and a road structure so complex that it makes public transportation slow and inconvenient. Past precedent suggests that this kind of development can lead to a serious decrease in standard of living, a cultural reality foreign to a country that has always prided itself on its progressive social policy and fluid class structure. Sigrun Birgisdottir, director of the architecture department at the Icelandic Arts Academy, explained how the lack of urban organization is symptomatic of the Reykjavik planning authority’s difficulty administering such large-scale development. “The regulation system—both financial and political—was accustomed to a small-scale sense of the town,” she said. The authority literally was unable to control or account for most of the construction happening in the past few years. The overwhelming feeling among Icelandic architects is that the architects themselves, as well as developers and city planners, should have known better. “There really has been no organized Icelandic architecture community,” said Birgisdottir, a situation that contributed to the current state of affairs. Until 2001, when the art school opened its undergraduate architecture program, there was no institution to foster conversation among architects. “Icelandic architects would return from studying abroad in their late 20s and then meet each other for the first time as professionals in competition with one another,” Birgisdottir explained. Guja Dögg agreed, adding, “That doesn’t exist among my generation of architects.” Birgisdottir, Dögg, and Mathiesen are all hopeful that the current state of the architectural industry will allow the country’s architects the time and space to have these long-overdue conversations. Bjorn Martensen, an architect and civil engineer, is organizing a team to create a review of quality control and assessment processes, while another group is planning a workshop where architects, industrial designers, and other creative professionals can come together to foster innovative design. Some firms are considering an arrangement with the government whereby architects would continue to work while receiving unemployment benefits if the firm could provide ten percent of the salary. Skylights for the metal shop and cantilever office addition in seattle. Both principals have undergraduate experience in engineering, but their work doesn’t necessarily put structure front and center. Through careful site and program analysis, they often uncover unexpected design opportunities, which they exploit with an artful sensibility. One such opportunity came in the form of a hundred-year-old frame house slated for demolition on the site of one of their projects. In one day, Hutchison and Maul, with the help of friends and associates, pierced the structure with thousands of holes, turning the house into an eerie lantern. That night, they threw a party in the transformed space, giving the house a last act before the wrecking ball the next day. “Hole House 1 was about exploring light and structure, and a way to celebrate the life of the building,” Hutchison said. The two replicated the experiment with a more humble structure, not surprisingly called Hole House 2, and inserted colored acrylic rods to heighten the beautiful and haunting effect. For a below-grade metal shop, the architects took a code-required parking screen and turned it into a thin, sawtooth skylight clad in Cor-ten. In profile, it looks like sculpture. 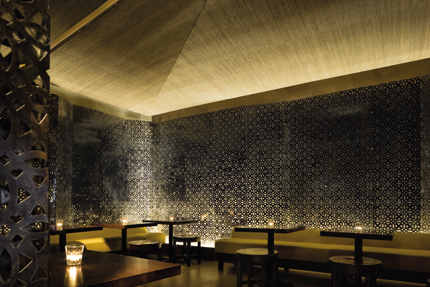 Inside, light washes the concrete walls, elevating the quality of the space, while meeting its programmatic requirements. “We don’t just grab the latest, coolest thing. We try and have self-control,” Maul said. “We like what is tested, what is tried-and-true.” This sense of finding unexpected possibilities in the pragmatic spaces of everyday life will be put to the test in their largest project to date, a 16,000-square-foot public works operations center in Bothell, Washington, clad in wooden planks with a broad entrance overhang projecting into the tree-dotted site. The center will break ground in the next few months. 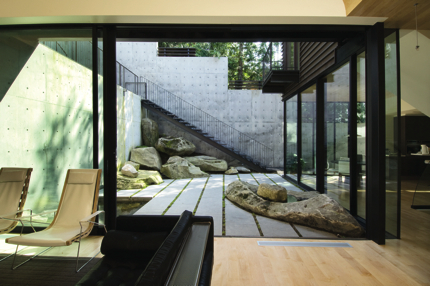 The Courtyard House in Mercer Island, Washington. A cottage in Guilford, Connecticut. The husband-and-wife team behind Gray Organschi Architecture aims to instill the robust traditions of design-build with a lighter but no less hands-on approach. Using expressions such as “pre-staged,” “lightly pinned,” and “on the site as little as possible,” Elizabeth Gray explained the firm’s philosophy of developing low-impact building practices in tandem with innovative technologies in the service of an architecture of elegant simplicity. A near state-of-the-art fabrication shop at their New Haven studio has helped them undertake ambitious prefabrication efforts, from a 75-foot footbridge in a hilly forest to the glue-laminated arches for an acoustical plywood shell within a brick firehouse turned recording space and auditorium. 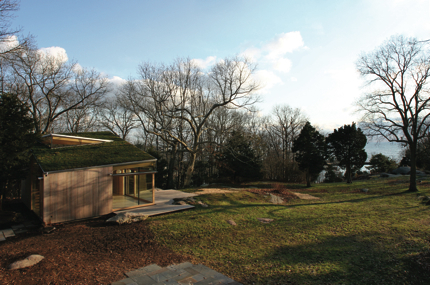 Gray and her husband Alan met at the Yale School of Architecture (where the barn-raising approach to design-build has a long history), graduating in 1994. Following a grand tour of sorts with stints in Indonesia, London, and Berlin, they returned to New Haven in 2000 and set up their practice in the Ninth Square, a notoriously seedy quarter but also home to many sturdy 19th-century brick warehouses ideal for an expanding design practice with a need for heavy machinery. More than half of the firm’s built work so far has been residential, including a guest cottage in Guilford completed in 2008 for a couple with expanding space needs but a desire not to disturb their gardens. Gray Organschi responded with a discreet structure (it had to pass zoning as an “accessory building”) that combines the camouflaging effects of a sedum green roof with the bursting energy of dematerialized glass seams and bamboo-clad folding planes. 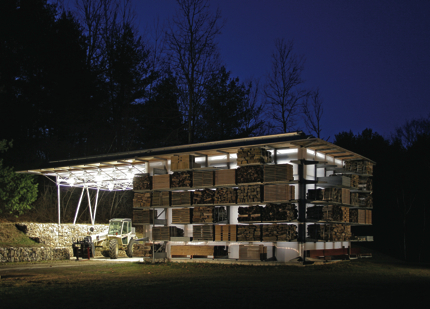 A storage barn for a landscape contractor turns a simple shed into a thing of beauty by simply stacking materials—with dimensions derived from the size of a pallet—around a void determined by the turnaround space needed for a loading tractor. Ground-source heat pumps and electricity are powered by rooftop photovoltaic panels, with surplus energy to spare. Moving on to a larger scale, the architects are now working on a residence and chapel for a community of Jesuits at Fairfield University. The 20,000-square-foot center, which includes an administrative wing and student dining room, needs to be both publicly active as well as a serene place of meditation and privacy. The architects tucked the building into the shoulder of a sloping hill, with a garden green roof and a public porch facing east and the Jesuits’ own rooms gathered around a courtyard facing south. “Our goal is to first analyze the program as honestly and as in-depth as possible, and then honor it,” said Gray. A storage barn in rural connecticut. 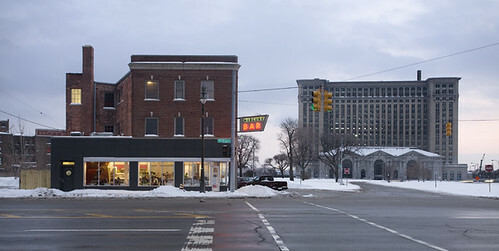 The collapse of Detroit has been a subject of fascination for artists, architects, and urbanists. In the current economic environment, the symbolism of the city's decline threatens to overshadow the human and physical realities of the place. 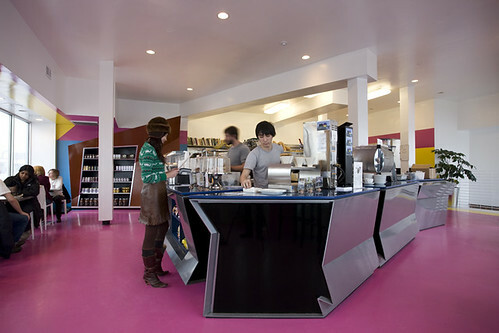 And while few would argue that the city will ever return to its height, it is nice to be able to show a project that disrupts the city-in-free-fall narrative, such as the new Mercury Coffee Bar, designed by Andrew Zago. No architect has been more closely associated with working on and thinking about contemporary Detroit's plight than Zago. In his latest project, he's created a bright, cheerful refuge in the city's desolate landscape. Zago characterizes Mercury Coffee as a "third wave" coffee shop, with diners representing "first wave" and Starbucks as "second wave." Mercury specializes in fine, gourmet coffee, with each cup treated with the care of a glass of fine wine (think Intelligentsia Coffee in Chicago). The shop was opened by Todd Wickstrom, a veteran of the Slow Food Movement. "Knowing that the second wave typically used the coffee-shop-as-living-room model for its design (vestiges of which still inform Starbucks) we sought a different atmosphere. It would be difficult to give a single phrase explaining our model, but I suppose a coffee shop as showroom is the closest. Our approach resulted in a sharp contrast to the exterior and certainly the surrounding area, but the intention was more to avoid reflecting on Detroit's troubled physical state," Zago wrote in an email. 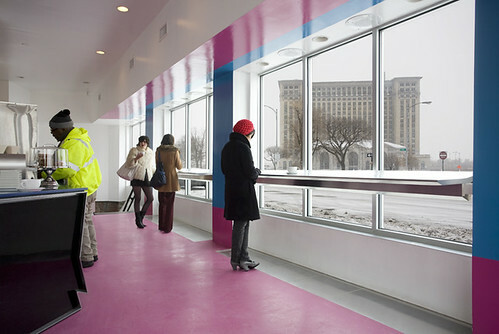 The vivid interior eschews the coziness of favored by Starbucks in favor of something much more contemporary, and unique in Detroit. "The colors, taken from CMYK printing, make entering the space a palpably different experience from the rest of the city," he wrote. Zago doesn't think the bar will cause anyone to forget Detroit's condition--it's hard to ignore the scenes out the window, after all--but he hopes to offer something other than nostalgia and the romance of ruins. 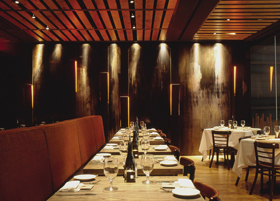 According to Wickstrom and Zago, the place has proven wildly popular. A wine bar is planned in the lower level. Detroit residents, like the rest of us, could use some cheer and a good cup of coffee. 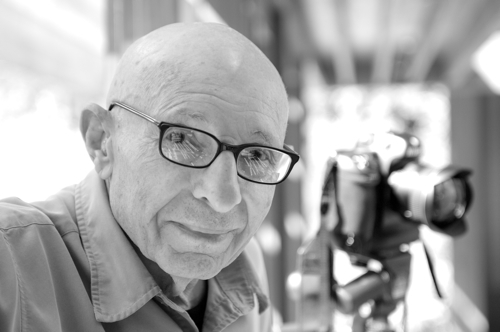 Photographer Marvin Rand spent his life devoted to architecture. Starting in the 1950s, he stood at the shoulders of some of the most influential architectural figures of the twentieth century, leaving a record in images that still teaches us today. Esther McCoy, Charles and Ray Eames, Louis Kahn, Welton Becket, Craig Ellwood, Cesar Pelli, John Lautner, Ray Kappe, Frank Gehry, Thom Mayne—a body of work that could have left any one satisfied. Not Marvin. Close to eighty years in age, he crossed over to the 21st century and started working with a new generation including such individuals as Michele Saee and Greg Lynn. Never mind that heart problems continued to dog him, and that he almost always left one essential piece of photographic equipment back in the office, he continued to record important work by both young architects and established ones. He would not stop. He did not cede to the frailties of his body, even as his wife, Mary Ann Danin, in support of his determination, quietly eased his path. In his mid-70s, an age where many chose not to learn the new, he dropped his lifelong habit of developing his own film and went digital—forcing himself to engulf a whole new technology for bringing work to light. 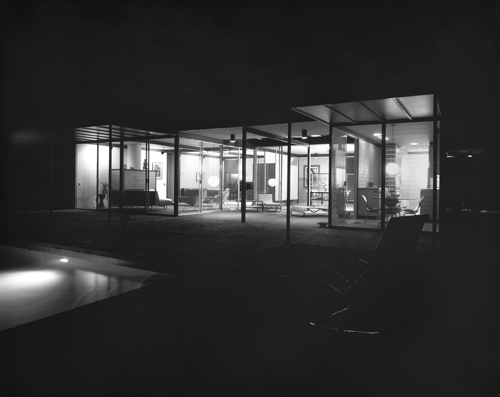 Craig Ellwood's Case Study House 16. His approach was not simply about images. He advocated on behalf of excellence in our field, and was a champion of great work. He recorded the works of Greene & Greene and meticulously scoured every inch of the Watts Towers. Through McCoy, he discovered the work of Irving Gill, photographing it for an exhibition at the Los Angeles County Museum of Art in 1958. Almost forty years later, he returned to the architect, spending a decade researching and traveling across the country to shoot images that documented not only Gill’s greatest work, but lesser known projects that were equally important. For the book that derived from this effort, Marvin often re-shot Gill homes at his own expense, which he had previously photographed. When I asked him why, he told me he felt that his original photographs did not adequately capture the spirit of the architect’s work. We had many such walks. The Salk Institute, designed by Louis Kahn. I met him almost twenty years ago to this day; it was a shotgun marriage. Marvin was assigned by Angeles magazine to photograph one of my early houses. After the shoot, when I finally met him at a party at the owner’s house, he came right up to me and proceeded to tell me what I should have and should not have done to make my design better. One might think I would have been shocked and angry with him, but his deep interest in architecture and in my work was rather infectious. Instead of being put off I thought to myself, “I could like this little fireball of enthusiasm.” We became instant friends and worked together ever since. Marvin refused to hire staff, so for two decades I am proud to say: I was Marvin Rand’s assistant. For more than half a century, he used that camera to fight on behalf of our profession. Ray Kappe shares his memories on the A/N Blog. Party’s over, kids: In a real sign of the times, the annual MoMA/P.S.1 summertime installation is no longer known as an “urban beach,” but an “urban shelter.” Admittedly, it did become a farm last year, but the trend is a sober one: The New Haven and Cambridge– based firm MOS named their winning proposal Afterparty. The project comprises a series of aluminum-framed conical structures whose dark, thatched skin will provide shade. The tent-like shapes, which will range in height from about 15 to 40 feet, are open at the top to create a chimney effect by drawing hot air up through the aperture by induction, to be replaced by air cooled at the ground level by the thermal mass of the courtyard’s concrete walls. Concrete water troughs at the center of each tent will further cool the air. Each summer for the last 11 years, the museum has sponsored a competition to design a shade-and-water structure for its wildly popular summer DJ series, Warm-Up. Five teams are asked to submit proposals for the structure, and the winner is given a budget of $70,000 and four months in which to build it. MOS, which also just won a Progressive Architecture Award for a drive-in in Marfa, Texas, beat out the proposals of four other teams: !ndie architecture of Denver, Colorado; and L.E.F.T. architects, Bade Stageberg Cox, and PARA-project, all of New York. The commission is a valuable one, and prior winners have included SHoP Architects, Work AC, and Los Angeles–based Ball Nogues Studio. For their submission, MOS’s Michael Meredith and Hilary Sample wanted to get away from the baroque excess that has characterized much of high-end architecture over the last few years (see under: installations in the Venice Biennale’s Arsenale). “With the Afterparty, we weren’t just thinking about it in terms of the economy, but as architecture, too. We felt the need to look for new methods of design, after the party of a sort of high-formalism that has dominated academic discourse,” said Meredith. The pair also sees the installation (which is in part inspired by the forms and functionality of Bedouin tents) as a respite from the often-frenetic nature of the Saturday evening parties at P.S.1. 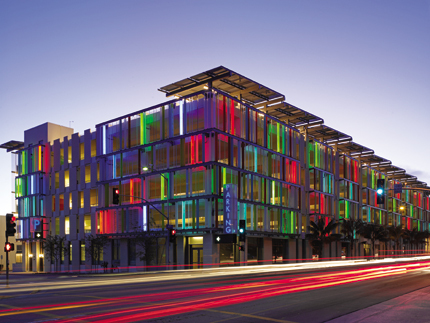 Almost a decade after they first submitted a proposal to renovate the Beverly Hills Post Office, Culver City-based SPF:architects on January 22 received EIR approval from the Beverly Hills City Council to begin work on transforming the building as the centerpiece of a new cultural center. The Wallis Annenberg Center for the Performing Arts will use the original 1933 post office for administrative, exhibition, and workshop spaces, while a separate building will contain a contemporary performance center. The firm is midway through schematic design and hopes to start construction on the estimated $35 million project within a year. The Italian Renaissance Revival building, originally designed by Ralph C. Flewelling with Allison & Allison Architects, was built as a Works Progress Administration project on a trapezoidal lot facing Beverly Hills City Hall. It was in danger of being demolished after the U.S. Postal Service vacated the building in 1993. But eventually it received landmark status and was sold to the City of Beverly Hills, which in turn leased the building to the Beverly Hills Cultural Center Foundation, with the intent to preserve and restore it. SPF:architects has entered a total of three proposals for renovating the post office as the anchor of a new performing arts center: one in 2001 when they were not shortlisted, and a year later when they were, although their proposal was not selected. 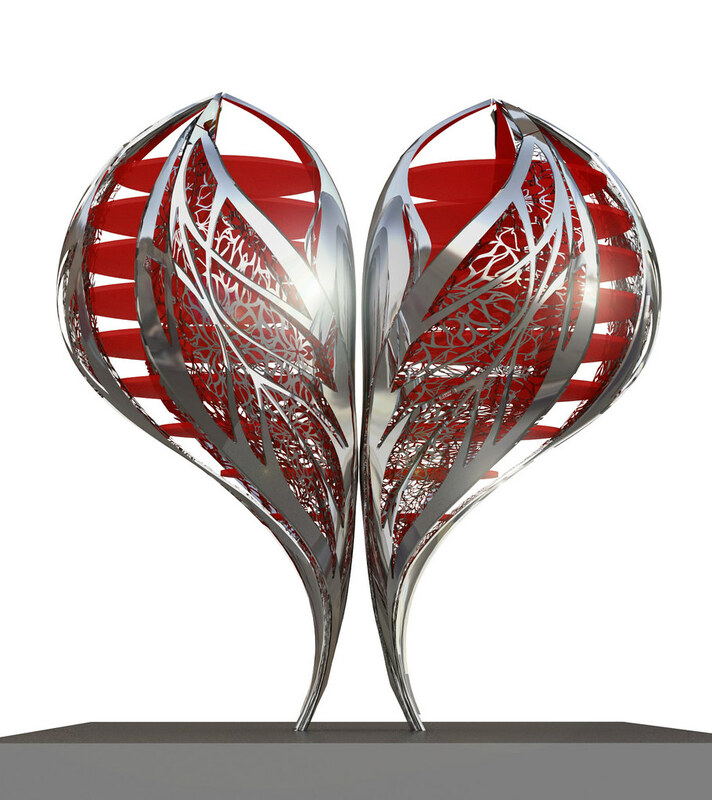 In 2006 a third competition selected SPF:architect's concept. The proposals selected previously—by Barton Myers and Pfeiffer Partners—focused on gutting the post office to make room for a 400-seat theater, and designing a separate building for education and administration, according to SPF:architects principal Zoltan Pali. "I just reversed that," he said. 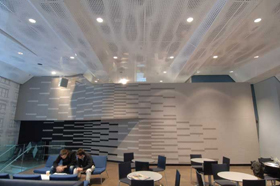 "I put all the little pieces—the little offices and classrooms—that fit into the building very perfectly, without having to do any structural renovation, and then we built a brand new state-of-the-art theater." The new building, which will be called the Goldsmith Theater, will be rectilinear in form and fronted with a patterned and textured facade. It will have 500 more seats than those of the two other proposals. A three-story glass bridge will connect the theater to the post office, which will house the box office, rehearsal rooms, classrooms and other offices. A courtyard and sculpture garden will provide landscaped public spaces around the buildings. To include enough parking for events, the plan calls for removing the lawn of City Hall to add submerged parking, then restoring the lawn. SPF:architects' design will also play on many elements of the post office's former use. The Grand Hall includes two WPA-era fresco murals depicting the birth of the U.S. mail service and life during the (now a little familiar) Depression, both of which will remain. The cages where stamps were once sold will, appropriately, be the box office, and the old mail sorting room is due to become a rehearsal space and studio theater. "I never really saw this building," said Pali. "It's a great example of that period of architecture and is a very respectable building, but I don't think it responded to the site as well as it could have." Pali sees it as a chance to invigorate this busy corner in Beverly Hills in a way that will allow it to interact with City Hall across the street as well as with the bustling business district nearby.